NETWORK UPDATE: There were no adjustments from this morning’s ratings. CABLE HIGHLIGHTS: ESPN’s NBA doubleheader carried the night with 0.90 for the late game, the earlier match was 0.61. 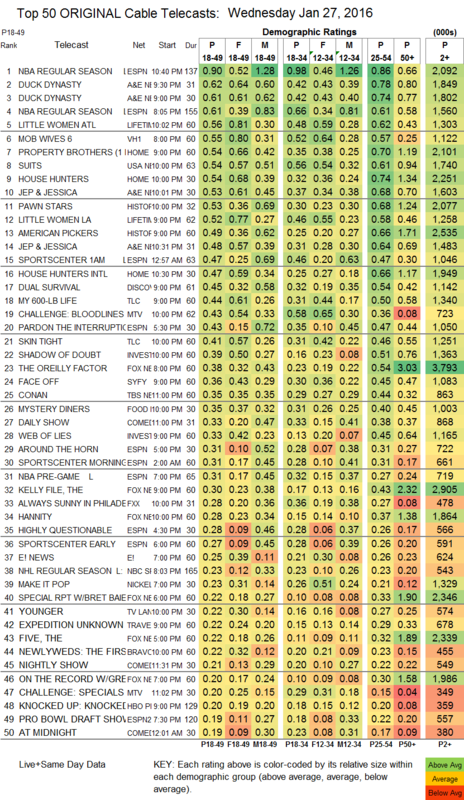 A&E’s DUCK DYNASTY was at 0.62/0.61, compared to last week’s season premiere 0.79/0.78, with lead-out JEP & JESSICA at 0.53/0.48 compared to 0.73/0.62. On Lifeitme, LITTLE WOMEN ATLANTA was at 0.56, with lead-in LITTLE WOMEN LA at 0.52. On HGTV, PROPERTY BROS was up 0.13 to 0.54, with HOUSE HUNTERS up 0.17 to 0.54 and HOUSE HUNTERS INTL up 0.07 to 0.47. VH1’s MOB WIVES dropped 0.03 to 0.55. 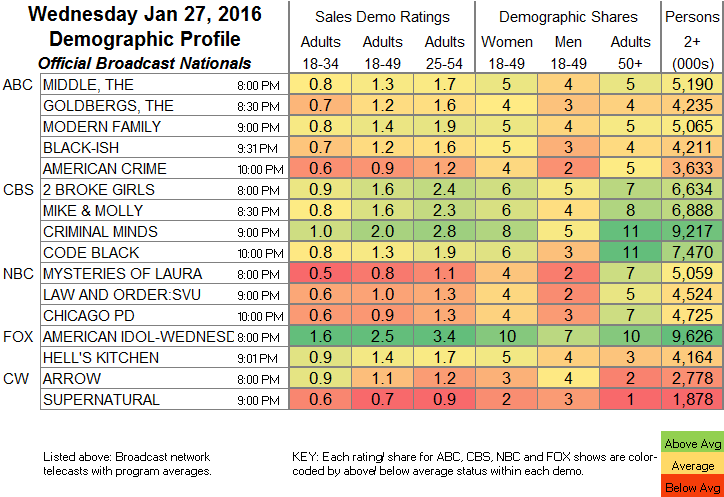 SUITS returned to USA at 0.54, just about the same as last January’s midseason premiere. On History, PAWN STARS edged up 0.02 to 0.53, and AMERICAN PICKERS lost 0.04 to 0.49. Discovery’s DUAL SURVIVAL gained 0.05 to 0.45. On TLC, MY 600-LB LIFE dropped 0.04 to 0.44, and SKIN TIGHT was down 0.02 to 0.41. MTV’s THE CHALLENGE fell 0.13 to 0.43, with an AFTERSHOW at 0.20. Syfy’s FACE OFF ticked up to 0.36. On FXX, IT’S ALWAYS SUNNY IN PHILADELPHIA dropped 0.07 to 0.28, and MAN SEEKING WOMAN collapsed by half to 0.07. YOUNGER rose 0.02 to 0.22 on TV Land, and also returned to Nick At Nite with 0.19, while TEACHERS was up 0.01 to 0.15 on TV Land plus 0.16 on Nick At Nite. Bravo’s NEWLYWEDS: THE FIRST YEAR climbed 0.03 to 0.22. FYI’s KOCKTAILS WITH KHLOE fell 0.05 to 0.11.